Five centuries of music for recorder consort, inspired by birdsong and nature. 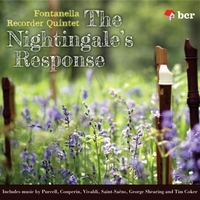 A sequel to the much-loved 'Woods So Wild' (BCR014) this album continues Fontanella’s journey into repertoire inspired by birdsong and nature. Featuring canzonas, concertos, songs and keyboard transcriptions by Purcell, Couperin and Vivaldi, as well as sparkling new arrangements of two jazz standards, and the magnificently quirky 'Wild Wood' by Tim Coker.